MANILA, Philippines – After a very frustrating campaign and getting blanked by Estonia, Netherlands and Iceland in the recently concluded Toyota 4-Nations Basketball Pocket Tournament in Europe, the Gilas Pilipinas Men’s National Basketball Team are now ringing the bells in the 37th William Jones Cup in Taipei. Our Men’s National Basketball Team posted a 2-1 Win-Loss record after giving Russia a painful beating on Tuesday, September 1, 2015 at the Xinchuang Gymnasium in Taipei. Gilas head coach Tab Baldwin concluded that his team are now in synched and has finally shrugged off the rust to keep the machine well-oiled and running. The Manny V Pangilinan-backed-up team, led by the 42-year-old Asi Taulava and once Asia’s best point guard Jimmy Alapag who was forced to make a comeback after officially hanging his jersey opened the prestigious tournament with a win and humiliated the Taiwan Men’s National Team in their home turf 77-69. Team Pilipinas maintained their double-digit lead of as high as 19 points before the first half ended. Taiwan re-grouped during the half time huddle and outscored Gilas 23-7 in the 3rd quarter. Gilas new-comers Terrence Romeo and Calvin Abueva took charge in the 4th period to regain the lead and sealed the deal. Romeo and Abueva had game highs of 18 and 15 markers respectively. Naturalized Filipino Andray Blatche flew back to US to attend his uncle’s funeral and will most likely miss the entire tournament. Lack in legit big men became the Nationals’ waterloo in a tight match against our Asian arch-rivals South Korea. Asi Taulava,Mark Pingris and rookie top pick Moala Tautuaa were not able to contain Korea’s 7’3” Ha Seung Jin who had a stint with Portland Trail Blazers in the NBA that costed Gilas its first loss, 70-82 despite of Terrence Romeo’s 23 point-effort and Gary David’s 16-point hot shooting night. With just less than 24 hours of preparation, Coach Baldwin and his assistants fixed their lapses against SoKor and applied it in their game versus Russia that resulted into another W, 85-71. Although Gilas won in a very convincing way, the boys had to do it the hard way. The tall Russians tried to get physical as early as the opening period to gain the momentum and lead. Sonny Thoss suffered an open wound in the head due to an advertent elbow from a Russian player off the rebound. It was a big mistake for the hefty Russians to play a dirty ball game against the well-known bruisers of PBA. The boys held their ground, refused to get bullied and returned the favor to team Russia. Terrence Romeo hit the deck and got a solid ball thrown at his face from his defender but “The Rock” Asi Taulava saw it and rushed towards the offender along with fellow Fil-Tongan Moala Tautuaa. Referees and other officials of both teams hurried to the court and pacified all the heated players. The Russian player who threw the ball at Romeo’s face was slapped with a technical foul while none for the Gilas side. Team Pilipinas maintained its double-digit lead until the end of the ball game with five players in pretty decent numbers under their names. At 3pm tomorrow, September 2, Gilas Pilipinas will face another Asian power-house team Japan where naturalized Japanese player JR Sakuragi and “Pinoy Sakuragi” Marc Pingris will once again face each other. 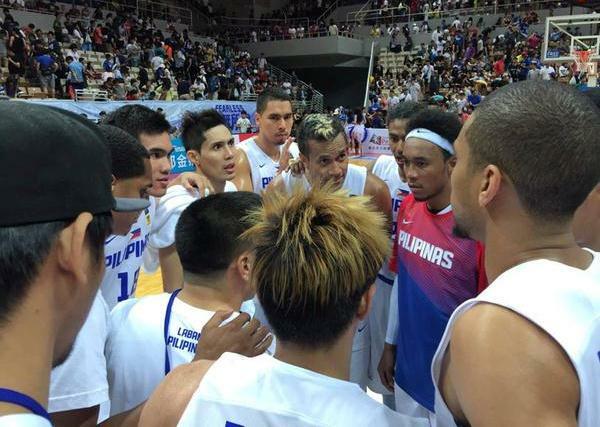 Philippines 85 – De Ocampo 13, Romeo 11, Abueva 10, Tautuaa 10, Ganuelas 10, Intal 8, Taulava 7, Rosario 6, Hontiveros 6, Alapag 3, Thoss 1, Ramos 0. Russia 71 – Glazyrin 23, Goliakhov 12, Uzinskii 11, Savelev 10, Ferorkhov 5, Fediushin 5, Ivanov 4, Zverokv 1.